Fauquier Hospital hosted a Medical Day Camp for about 25 teenagers last Thursday and Friday. The kids had the chance to experience life in the pharmacy, respiratory, vascular and medical imaging departments, and loved the hands-on exercises. 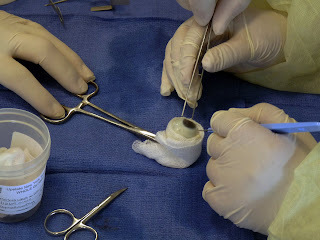 They learned about sterile environments as tried their hands at suturing (pigs' feet); harvested eye corneas; tested their blood types; and took on roles during a (mock) mergency in the Emergency Department. The day ended with an obstacle course involving bandages, wheeelchairs and special goggles that simulate impaired faculties ("drunk goggles"). The students, aged 13-17, had a blast, as did the instructors, tagged from departments all over the hospital.